A biracial student questions her identity in this contemporary novel from the author of the Coretta Scott King/John Steptor Award–winning The Rock and the River. Ella and Z have been friends forever, both of them middle-school outsiders in their Las Vegas suburb. Ella is the only black girl in her grade and gets teased for the mottled colors of her face. (Her deceased father was white.) Z is the classic “weird kid” who maintains an elaborate—and public—fantasy life, starring himself as a brave knight. 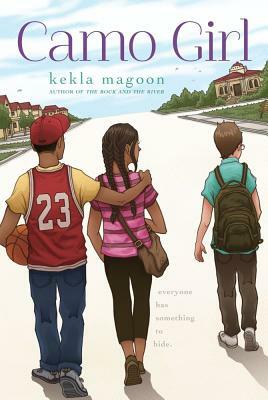 Though Z is content with his imagined world, Ella wishes for a larger group of friends, so she’s thrilled when Bailey, another black kid, arrives at their school. He’s popular and wants to befriend Ella—but to join the cool crowd, Ella would have to ditch Z. Does she stay loyal to the boy who has been her best and only friend for years, or jump at the chance to realize her dream of popularity? Author Kekla Magoon deftly navigates the muddy waters of racial and cultural identities in this contemporary exploration of one girl’s attempt to find herself. Kekla Magoon has worked with youth-serving nonprofit organizations in New York City and Chicago. She holds an MFA in writing for children from the Vermont College of Fine Arts and her first novel, The Rock and the River, won the Coretta Scott King–John Steptoe Award for New Talent. She resides in New York City and you can visit her at KeklaMagoon.com. "This elegantly crafted story features strong writing and solid characterizations of both main and secondary characters. Ella and Bailey’s racial identity is one element in a full and richly textured narrative. An out-of-the-ordinary setting—just outside of Las Vegas—and the nuanced picture of young teens and families under stress make this an outstanding follow-up to Magoon’s Coretta Scott King/John Steptoe Award–winning debut, The Rock and the River (2009). "All characters are well constructed. The story is written in a style that many early teens would appreciate for its real life parallels and issues. "